The tale of "The Shipwrecked Sailor" ends with a note that it was copied down by the scribe "of cunning fingers, Ameni-amenaa". This could be a little boasting by Mr. Ameni, who seemingly goes over the top with the exclamation that follows: "may he live in life, wealth, and health!" This latter, however, is a standard phrase used for any respectable person at the time. But this Ameni-amenaa is really part of the narrative itself. In some translations of the story, the Pharaoh is taken with the sailor's tale of having been stranded on a magical island with a talking serpent and orders his scribe to record it for posterity. In any case it hardly seems like an historical account recorded by a disinterested scribe. It is possible though the story may have been first created by a scribe or artist in the royal court. Despite its simplicity, it reveals the narrative skill and ironical touch of a practised storyteller. It has been conjectured that the story, with the list of perfumes and spices that the sailor brings back from the serpent, is meant to celebrate the opening of trade ties with another state at the time, which would indicate the author was indeed politically connected. This other state was in the mysterious Land of Punt—"mysterious" because we aren't sure today exactly where it was. To the Egyptians then it was an exotic land of plenty and today's scholars place it anywhere from south of Egypt on the Red Sea or ocean coast to east of Egypt in Arabian domains. Another interpretation of the shipwreck tale however gives religious significance to the serpent, as a representation of a god, and makes the sailor's adventure a spiritual quest, implying a different motivation for the tale's composition. The sole papyrus scroll that records "The Shipwrecked Sailor" was only discovered about a century ago. It has been dated back to the middle of Egypt's Twelfth Dynasty (1991-1782 BCE), though most think it was written in the early part of the dynasty. Some translations name the Pharaoh of the story as one who ruled in 2000 BCE, but we cannot be certain this is part of the original story. 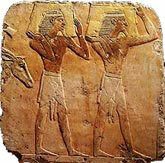 It may have been passed down from an earlier time, as long ago as 2200 BCE according to some researchers.